I’m a great fan of chai/tea. Hot tea, preferably with spices always revives me from tiredness/stress! 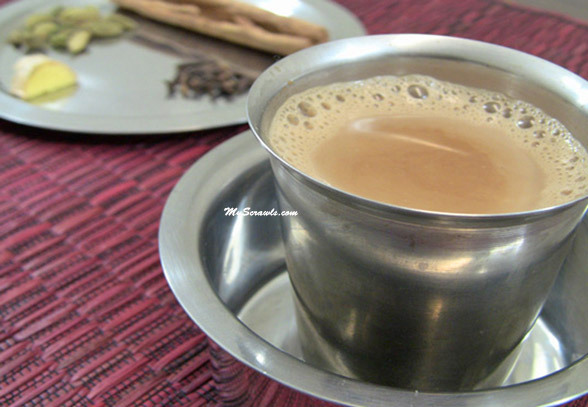 I have used fresh ginger to make the masala chai powder. If you have powdered ginger and cinnamon, use 1/4 tsp of each in the recipe. Crush ginger, cinnamon, clove and cardamom using a pestle. Add tea powder and crushed spices with water and allow it to boil. Then add milk and boil it for a minute. 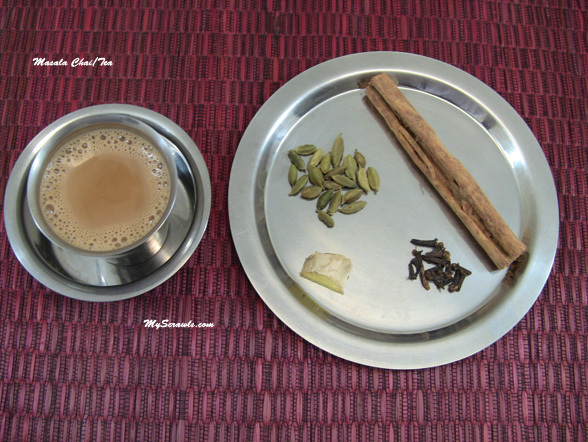 Remove from the stove top, strain the tea, add sugar and enjoy your cup of masala tea/chai! Thanks for this wonderful recipe, I really like ginger tea in the winter time. thanks for the recipe.I’ve been serching for longtime.In my plce Pattani town there is no Indian food stall or restaurant at all.I love Indian food.